Alpinia caerulea ‘Atherton Ginger’ or Red Back Australian Ginger is a beautiful ornamental plant with bright blue berries. 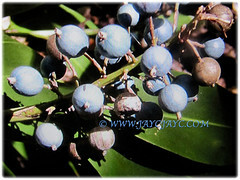 The edible blue berries may be picked and eaten straight off the stem. 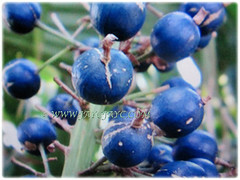 It is a versatile plant that is traditionally used by the Aboriginal people for food and crafting. 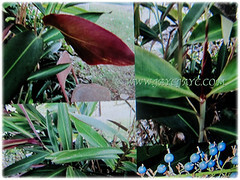 Common Names: Red Back Australian Ginger, Blue Ginger, Native Ginger. Origin: Native to Queensland, Australia. Plant type: A shade-loving evergreen and perennial tree. Features: Alpinia caerulea ‘Atherton Ginger’ is from the genus Alpinia that consists of about 230 species of flowering plants. A fast-growing, clumping and upright plant with fleshy stems that can grow between 1.5-2 m in height and 1 m wide. The shortly petiolate or sessile and large leaves of this species can grow to 55 cm long and 10 cm wide as well as alternately arranged along the stems. Long spikes of white, tubular and shell-like flowers are borne for most of the year in warm regions. Eventually, the fragrant white flowers will be followed by clusters of bright blue berries that may be picked and eaten straight off the stem. 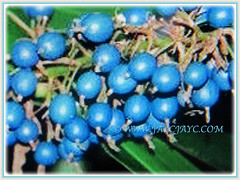 The globular fruits which are 10-18 mm in diameter are green, before they ripen to a brilliant blue, giving the plant its other common name, Blue Ginger. Its fruit contains numerous seeds. 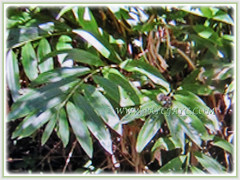 Culture (Care): Alpinia caerulea ‘Atherton Ginger’ can be grown easily with least maintenance. Soil: Humus-enriched, sandy loam, constantly moist and well-drained soils. Others: Remove spent flower stems and leaves two to three times a year to keep the plants tidy. Cut old canes to their base. Requires protection from strong and dry winds. Once every two months, feed the tree with a 16-16-16 fertiliser to stimulate growth and fruit production. Generally free from serious pests and diseases. Alpinia caerulea ‘Atherton Ginger’ is a very hardy and evergreen ginger plant that is quite cold tolerant. It thrives well in subtropical and warm temperate zones. Frost will damage the leaves but it should reshoot once the danger of frost is over. However, hard and prolonged frost could kill the rhizome. Feed in spring and mulch well before summer. The reddish foliage may be pruned throughout the year as the leaves age. Propagation: Easily propagated from seeds that normally takes about two months to germinate. Alternatively, it can be propagated by division. Usage: Alpinia caerulea ‘Atherton Ginger’ or Red Back Australian Ginger is a versatile plant that is traditionally used by the Aboriginal people for food and crafting. 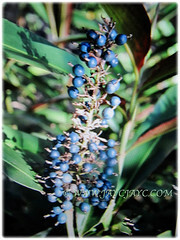 Both the spicy root and bright blue fruits may be eaten. Its ginger-scented rhizome may be used, like other ginger roots, in savory dishes, desserts, jams, marmalades, candies and tea. The Red Back Australian Ginger’s large leaves were traditionally cut and used in thatch shelters and as food wrappings during cooking. Cut flowers and foliage for indoor decoration. It is suitable for large planters, pots, borders, poolside and mass plantings. Also, excellent as a landscape specimen. Grow to attract birds, bees and insects.